Note from Davonne: I have received an unbelievable amount of messy photos and questions for the Get-Organized challenge. I just want to extend a huge THANK YOU to everybody who has jumped on board with participating! In order to answer the responses in a timely manner without nearly killing myself, I’ve decided to bring in a few experts to help me out. Today’s messy situation is being handled by Dani from DaniDearest.WordPress.com, and her blog is full of fresh and fun simple DIY ideas! My desk used to be my weak spot for organization. I would throw papers here, I would toss pens there, I would store everything everywhere. It made no sense and it was disgusting. I didn’t like it in the least, but I didn’t do anything to change it. Why? I had no motivation. No reason to. Then, I discovered organizational blogs and I fell in love. Looking through posts of people who had organized their lives and created cute do-it-yourself crafts to help them out made me really excited. I wanted to be like that! So I got down and got to work. It worked really well for me, I’m now the most organized out of my friends. Your first step? Find the motivation. Since you’re here, chances are that you already have some of that. You’re trying to fix it, you’re taking the steps toward it, and that’s fantastic. Through that, and finding cute organization sources through Pinterest, my desk is now my organizational strength. And it can be yours too. First off, it’s time that you go sort through your papers. This will get rid of the majority of the mess and will give you a basis to move on to the rest of the project. Davonne has previously made a great post specifically about paper clutter here. Once you have cleared out those papers, do the same with the rest of the things you have lying around. No matter if it is craft supplies, old photos, kids toys, anything really. Go through it and separate everything into five piles similar to those for the paper clutter. You can either make a box/bin for each pile (labeled, of course, so you don’t accidentally donate something you want to keep), or simply create piles on the floor. Throw away those in the throw away pile. Donate those in the donate pile. Move those in the “keep elsewhere” and “sort later” pile out of the room or on the other side of it. You’ll deal with these later. Take the items that you have left and sort them again into a couple more piles. Now the area should be clean, nearly everything should be out of it and sorted. Time to organize. First, let’s start with your desk drawers. 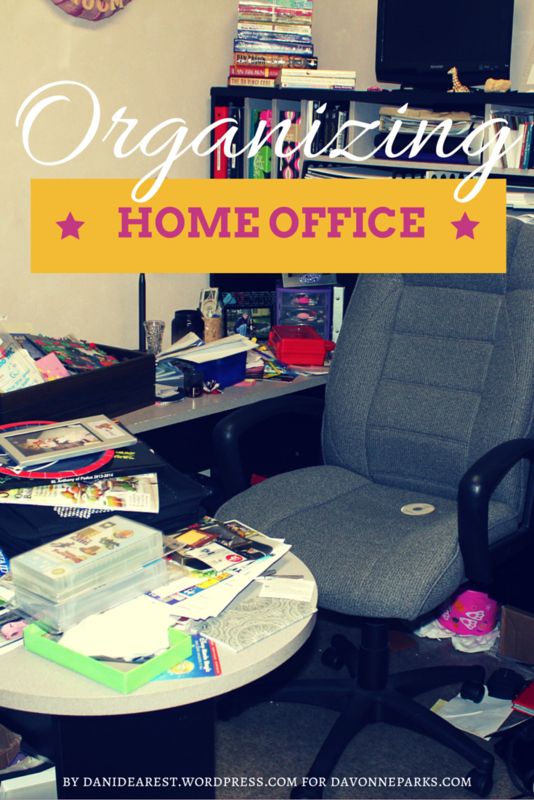 The easiest way to ensure that the items within your desk stay organized is to give each item a place to live. To do so, I recommend some sort of dividers. You can buy dividers from the store, sometimes they are available at your local $1 discount store, but other times they are a little pricey. If you don’t want to spend the money here is a very simple DIY tutorial on how to make drawer dividers out of cereal boxes! I made my own dividers out of cereal boxes to organize my makeup in. 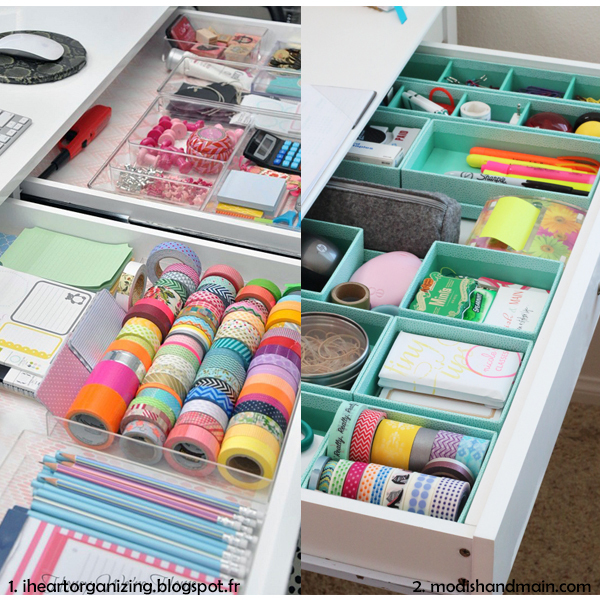 This is another post about a different way to make your own drawer organizers that I love! Once you have these dividers, go through the things that you put in the “keep in desk drawers” pile and start to give them a home. Simplify. Put the things that you use most often in the top drawer. The things least used in the bottom drawer. Place the things that you put in the “keep on top of desk” pile on top of the desk. Arrange them to look nicely, leave yourself a lot of open clear space to work. This needs to be the least cluttered of everything. Bookshelves are a great way to organize as well, and they don’t have to be limited to books alone! I recommend getting cute baskets or bins that you can store on the bookshelf with items in them. This hides clutter and organizes at the same time. Dictate one purpose for each basket. Maybe one basket for pictures, if you happen to have a lot of those laying around. One basket for keep sake papers (though I recommend buying a fire-safe box for the important ones such as birth certificates and social security cards and keeping it in a place where it can be easily located in an emergency). One basket for old projects that you might want to keep for the future. 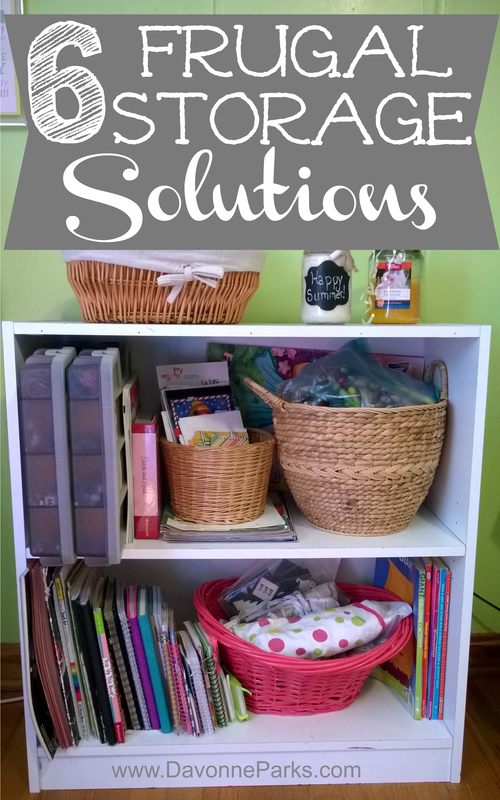 Create your own way to organize this! Save one shelf or filing cabinet for those papers that you aren’t sure where they belong but you do know you should keep. Do not stuff them in a drawer or basket. Get some colorful binders and label the sides to match categories of those papers. Maybe something like medical, manuals, kids (one for each of your children), pets, spouse, personal, work, and so on and so forth. This will give you an easy place to reference when you suddenly need the manual on the washing machine you got 3 years ago because it needs to be cleaned. These should all be papers that might need to be referenced in the future. Now it’s time for you to branch off from my directions. I see that you already have some attempts at organization lingering in the room. There’s a plastic three drawer organizer, some labeled binders on a shelf, and maybe some more that I can’t see. You have the ability, you just need the motivation. I recommend opening up Pinterest and searching “desk organization,” “office organization,” or even just “organization.” There will be thousands of amazing ideas that pop up. These always get me excited, and hopefully they will help you as well! Hi, I’m Dani! I believe that there’s a lot more to myself than anyone has so far discovered. That’s why I’m here, to try to discover more about myself through writing and sharing my thoughts with you. I think of myself of as a procrastinating overachiever. I tend to go above and beyond on silly organization projects, artistic things, and such… only because I’m procrastinating on something.